Dependable, ultra-pure silica-based HPLC columns that offer an extensive variety of selectivities which are scalable from micro-bore to preparative and purification scale solutions. Elimination of micropores, further improves column efficiency, inertness, and reproducibility. Rugged C18 with focus on strong hydrophobic retention of non-polar and polar compounds. Download the Luna product guide and view applications, method development tips and for optimizing separations with Luna UHPLC.HPLC columns. As one of the world’s most recognized HPLC brands, Luna is a high quality, industry standard that is incredibly dependable, batch to batch and column to column. With a highly versatile family of selectivities, Luna stationary phases will help drive your method development and leave you at ease with existing methods. See inside to explore the Luna family of reversed phase, normal phase, HILIC, and ion-exchange columns. Gain incredible performance with these innovative silica particle and selectivity additions to the world renowned Luna LC product line. Explore the many reasons why Luna Omega can boost your UHPLC separations. Luna C8(2) phase is an octadecyl silane with ligands are bound to the silica surface,resulting in a C8 HPLC column with hydrophobic stationary phase that offers moderate methylene selectivity. 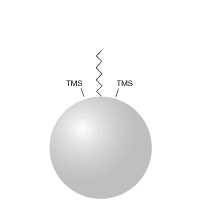 The non-polar endcapping of the Luna C8(2) column phase virtually eliminates silanol interactions resulting in an a reversed phase C8 HPLC column that offers improved performance over traditional C8 phases due to high surface coverage. *Luna C8 (2) is a recommended alternative to: Agilent Technologies® ZORBAX® SB-C8, and Waters Symmetry® C8. Agilent Technologies and ZORBAX are registered trademarks of Agilent Technologies, Inc. Waters, and Symmetry are registered trademarks of Waters Corporation. Phenomenex is not affiliated with Agilent Technologies, or Waters Corporation. What are the recommended long term storage conditions for HPLC columns? What changes are allowed to USP / EP gradient HPLC methods? Does high pH mobile phase reduce the sensitivity of basic analytes in LC-MS?